This is Part 3 (and final) of my mini-series analysing some of the challenges that the newly elected majority government in Timor-Leste faces. In Part 2, I discussed the progress of the Strategic Development Plan and the challenges ahead in terms of poverty, unemployment, and other indicators relating to the development process. In Part 2, I focused more on the currency debate – documenting how the IMF and World Bank had infused its ideological stance into the currency arrangements that Timor-Leste set out with as a new nation. I made the case for currency sovereignty which would require Timor-Leste to scrap the US dollar, convert the Petroleum Fund into its stock of foreign exchange reserves, and to run an independent monetary policy with flexible exchange rates, mediated with the capacity to use capital controls where appropriate. In this final discussion I consider specific policy options that are required to exploit what is known as the ‘demographic dividend’ where the age-structure of the nation generates a plunging dependency ratio. To exploit that dividend, which historically delivers massive development boosts to nations, the shifting demographics have to be accompanied by high levels of employment. That should be policy priority No.1. … makes Timor-Leste the 15th youngest in the world, behind only Afghanistan and a group of African nations. The population below age 35 accounts for 74 percent of the total population. In Timor-Leste, 40 per cent of the population are under 15. At present, the dependency ratio is Timor-Leste is 82 – that is, for “every 100 persons of working age must support 82 individuals who are not of working age, in addition to supporting themselves”. In Australia, the dependency ratio is currently around 54 and nearby Asian nations much lower. With such a high dependency ratio, the UNDP says that Timor-Leste is “currently experiencing a much larger economic burden than the populations of its neighbours. But demography changes and before long, the youth of Timor-Leste will be flooding into the Working Age Population and the dependency ratio will plummet for some decades as these young entrants work their way through working age. The UNDP observe that this “shifting age structure of the population of Timor-Leste in recent years has finally brought policy options to a crossroads”. By which they mean that economic development can exploit what is known as a – demographic dividend – which can harness very favourable dependency ratios – in this case when “the share of the working-age population (15 to 64) is larger than the non-working-age share of the population (14 and younger, and 65 and older)”. There is a huge difference between a nation with a high dependency ratio due to an ageing population and one with a high ratio due to a very young population. The future profile of those two cases is very different. In the former case, the task is to increase productivity of the existing workforce to ensure that the older workers can have access to first-class health care and pensions once they retire. Timor-Leste is in the latter case and its task is to ensure that the young people are well-educated, receive appropriate training (apprenticeships etc) and, most importantly, have jobs to go to once their schooling is completed to ensure the school-to-work transition is effective. … accounted for about 42 percent of the economic growth in developed countries and 39 percent in developing countries. But it doesn’t happen automatically. And it doesn’t happen through a blind observance of the ‘free market’. It requires a strong state with coherent plans and a currency capacity to support them. 1. Access to quality education. 2. Sound nutrition and child health care. 3. Jobs, jobs and more jobs to move into and become productive. Claims that Timor-Leste must run smaller deficits and spend less overall run counter to that urgency. It is obvious that the development process requires substantial investment in education. The gestation period from infancy to workforce is a generation and that requires sustained public sector support. The challenges facing Timor-Leste in developing a knowledge-based society through investments in education are well summarised in the latest UNDP Report (cited above). … ensures accessibility to opportunities among all individuals at the earliest stages of life and throughout the life cycle. First, even though there has been significant progress in the development of and participation in the education system in Timor-Leste (both general schooling and technical and vocational education and training (TVET)), the level of expenditure consistent with its Strategic Development Plan (SDP) is less than half that which is required. To implement this vision, however, the Government would have to more than double public investment in education, including substantial investment in teacher training, high-quality education facilities and appropriate teacher employment. This National HDR suggests that the Government draw on international best practice and con- sider allocating 25 percent of the budget to education and training to ensure access to quality education among young women and men. This would enhance meaningful human capability. In its – State Budget 2017 Book 1 – which provided a summary of the fiscal position for 2017, the then Government proposed to spend 16.1 per cent of its recurrent expenditure and 0.8 per cent of its infrastructure fund on Education. Clearly not enough given the challenge the nation faces. This is well below the accepted international benchmarks. Health expenditure which complements educational investments is also very low. The Government has prioritised expenditure on large physical infrastructure at the expense of human development. That distribution should be reprioritised. At present, capacities such as the ability to read in either of the two official languages (Portuguese or Tetun) is low. The World Bank found that “that 70 percent of first grade students in Timor-Leste were unable to read a single word of a simple text passage randomly selected in either of the country’s official languages” (Source). The adult literacy rate is around 58.4 per cent. The UNDP also notes the “gender gap” in education in Timor-Leste, which undermines the long-term effectiveness of the educational investments. Women, for example, are “are only half as likely as men to find work” and achieve high standard educational outcomes. A nation can not develop by excluding half its population from the productive talent pool. The second problem is that expanding investment in education and training is not a sufficient condition for reaping the returns that the ‘demographic dividend’ holds out. At present, the capacity to transition from that schooling or the TVET sector into formal sector employment is extremely limited. There is a widespread expectation among school-leavers that their education should lead to jobs in the formal sector. However, this is not the case even among graduates of … TVET. Investment in education and training can only generate returns if there are jobs to follow. While it was appropriate to prioritise the development of Timor-Leste’s education and training system, the priority now, as graduates emerge from that system, is for the Government to prioritise job creation. The lack of jobs has been a perennial issue in Timor-Leste. Timorese youth currently have extremely limited opportunities for formal employment. There is a scant private sector labour market – about 5 per cent of the total employment. In my past field work in disadvantaged regions (and countries), I have come up against government and multilateral institution (such as the IMF) officials who tell me that providing public work just undermines the development of the private sector labour market. The problem is that when there is no private sector activity, the public labour market is the labour market. And the task is not to deny that or to restrain the development of that but to make sure the public employment is effective and provides the kernel for crowding-in private investment and activity. The main occupation in Timor-Leste is agriculture – around 60-65 per cent of people are engaged in that sector, predominantly in a subsistance status. The services sector deploys about 39.8 per cent of the workforce. There is also a large proportion of the population that is classified under ILO labour force framework classifications as being inactive (around 45 per cent) – so they are studying or tending homes. A productive route for the Government to follow would be to start creating opportunities to the agricultural sector to add value to their activities without compromising the capacity of the people to feed themselves or destroy the relatively well-developed land tenure arrangements. The IMF and World Bank export-led obsession, which transforms subsistence agriculture into cash crops for export, has not been a productive way to go. When markets get flooded with over-supplies and prices drop below levels required to repay loans, the farmers are caught out – they are insolvent yet have undermined the subsistence basis of their activities. Timor-Leste is like many developing nations – the majority of its population are engaged in subsistence activities in the so-called informal sector. So it is hard to actually estimate the extent of unemployment or underemployment and the official estimates are relatively meaningless when trying to assess the extent to which labour resources are both available and idle. The official labour force data will grossly underestimate the extent of labour underutilisation. The 2016 Human Development Report published by the UNDP estimates the Employment to Population ratio for Timor-Leste was 39.3 per cent and the labour force participation rate was 41.3 per cent. Modern Monetary Theory (MMT) tells us that the reason there is mass unemployment in less developing countries is the same as there is mass unemployment in advanced economies. There are plenty of jobs to do in both types of economies. There is no shortage of work! In fact, in nations such as Timor-Leste there is an abundance of labour intensive work that can be done to improve the public amenity and infrastructure. Some of that work could be directed at creating an import-competing capacity to reduce the dependence on imported goods and services, particularly food. The problem is not a lack of jobs but a shortage of paid work. The solution is to fund the work that needs to be done in all economies. If a nation has idle labour then that means there is not enough employment-creating funding being injected into the spending system. As a starting point, the Timor-Leste government should take responsibility for providing work to all those who desire to earn a wage. There is a generational aspect to that. On the one hand, the adult population are mostly uneducated, with high rates of illiteracy. They have been agricultural labourers ekeing out a meagre existence. Creating paid work opportunities for that cohort requires thousands of low-skill jobs to be created which will add value to their local communities and their agricultural pursuits. On the other hand, the youth are increasingly being engaged within the education system, notwithstanding the continued problems with language etc. They need to have confidence that the years of study will be rewarded with job opportunities in the formal sector. In a nation that issues its own currency, the capacity to take responsibility for both challenges is clear. 1. Introduce a national currency. 2. Use it to exploit the ‘demography dividend’ through much larger job creation efforts and investments that are rich in employment leverage. A good starting point would be for the Government to introduce an unconditional and universal employment guarantee. But at things stand, even without its own currency, Timor-Leste is very different to a poor country that has few real resources to exploit. Timor-Leste, for the time being has oil and gas resources, which have been exploited and the returns accumulated in the Petroleum Fund – some $US16,799 million by the end of 2017. This fund gives the government an immense capacity to fast-track infrastructure, health, education, training and employment development. All of which are the essential building blocks to sustainable economic development. We will consider the Petroleum Fund presently. But in saying the Timor-Leste government has to take responsibility we also have to consider what sort of spending is best to advance that responsibility. The political divide that was evident in the recent election campaign is exemplified by diverse views on where the government should spend the Petroleum revenue. On the one hand, the current approach has been to invest in large-scale infrastructure projects – such as the South Coast highway project (Tasi Mane) and the Zonas Especiais de Economia Social de Mercadu de Timor-Leste (ZEESM) in the Oecussi region. The Tasi Mane project has absorbed billions of dollars in public outlays and was designed to capture more of the outcomes of the Petroleum industry for the domestic economy. It aims to build a new industrial zone (in three clusters) on the south-west coast to foster further petroleum development. The Oecussi special zone project (ZEESM) is also absorbing large outlays and focuses on tourism (big Chinese constructed hotel etc) at the expense of local development. Indeed, several small settlements were bulldozed to make way for roads and the hotel. I understand the politics that led the Timor-Leste government to take the decision to spend billions on these huge projects. To some extent they were pigeon-holed by outside pressure (IMF etc). But the reality is that while the Petroleum industry has generated significant revenue flows for the State, it is not well linked into the industrial structure of the economy and does not provide the sort of employment creation that will be necessary to exploit the ‘demographic dividend’ or to provide work for older underemployed adult workers in the agricultural sector. Large-scale projects also include the large outlays on the new airport and the container port. These are also not large employment and skill-development generators. So apart from the issues with land clearances, the destruction of local cultures, and other social costs that these projects have generated, the fact is they do not employ enough locals or provide effective skill development. The projects are dominated by foreign interests. Critics within Timor-Leste have noted that these funds allocated to the large projects might have been better spent invigorating local agricultural production to better insulate the nation from its imported food dependency or investing in an improved regional and rural road network to make it easier for remote farmers to market their produce. They argue that continuing to spend billions on the Petroleum industry, with uncertain multiplier effects back into the local economy (employment, skill development, etc), diverts funds from non-oil activities that would allow Timor-Leste to diversify its economy and set it up for the long-term when its natural resource wealth is depleted. There is considerable truth in those claims. Which is why I would develop and introduce a Job Guarantee as a matter of priority. It is clear that skill levels vary and in Timor-Leste there is a paucity of skilled labour. Does this mean that large-scale public works programs such as road building etc are unsuitable? Not at all. It just means that the public works programs have to be designed in ways that are inclusive to the least-skilled workers and are highly labour intensive. My work in South Africa (in relation to the Expanded Public Works Program which employed more than a million workers in the first five years of operation) taught me that large-scale public works initiatives can be very successful in alleviating poverty and improving intergenerational opportunities for families (adults get work, children perform better at school). They are difficult to organise and never ‘perfect’ but they add productive value to the communities and the people that participate in the work. The other thing that this experience taught me is that there are many ways in which a particular goal can be addressed. My interaction with civil engineers in South Africa was illustrative. The bureaucrats – engineers who had been educated in the US or Britain were horrified that labour-intensive road building methods were advocated. They wanted the best-practice methods commonly used in the most advanced nations, which end up employed hardly anyone per km of road laid. After all, they were educated in the advanced techniques. The scientific research though shows that the two methods of road building both produce first-class surfaces that are durable and effective. But for these sorts of programs to be successful, they have to be flexible and scale the employment reach to suit the circumstances. So the labour-intensive methods employ more and can be inclusive for the lowest skill workers but they still produce excellent roads. There are many more examples like this one that I could relate. Piecemeal and small-scale employment programs based on some limited international development aid might create a few jobs here and there. But what Timor-Leste needs are tens of thousands of jobs to be created in the first instance and the decentralised institutional structure developed to support this development. There is thus two issues. The micro one of building the capacity to run a large-scale employment guarantee. There are good models available to guide such a process. The second issue is the macroeconomic problem and the debate in Timor-Leste is yet to get beyond the IMF-type obsessions. The only way that nation such as Timor-Leste are going to move into the middle-income cohort of nations and be able to successfully create enough jobs for their rapidly growing populations is for them to abandon these nonsensical neoliberal concepts of ‘fiscal space’ and appreciate that the space for government spending is defined by the real resources the government can bring into productive use without creating accelerating inflation. Fiscal rules, such as the ESI in Timor-Leste, constrain the capacity of the nation to grow and to put in place structures that allow the nation to exploit is ‘demography dividend’. Once it is understood that the Timor-Leste could use its own currency to bring thousands of workers into the formal, paid economy and put in place structures that are capable of supporting the creation and administration of millions of public jobs, then development will accelerate. A growing local market will start to attracts private sector activity. The Dual-sector model developed by West Indian development economist W. Arthur Lewis in the 1950s remains relevant in these cases. Lewis conjectured that developing nations have a surplus of unproductive agricultural labour which can be released to other sectors (manufacturing in his case) without any loss of food production. The subsistence sector is a low productivity sector because it is labour intensive and when labour is attracted (or motivated by policy shifts) out of agriculture to higher productivity pursuits, there is no loss of output in the agricultural sector as the underemployment falls. The statutory minimum wage in Timor-Leste is $US115 a month (or about $US3.75 per day). It was last adjusted on June 22, 2012. Under the terms of the Labour Code n.4/2012 (established February 21, 2012), the minimum wage was meant to be reviewed two years after it became operational. It has been stuck at the 2012 level. In real terms that minimum wage level has dropped to around $US89 per month in 2018 or $US2.90 per day. The following graph shows the current nominal minimum wage (green) and its real equivalent as inflation has eroded its purchasing power since 2012. 77.7 per cent of those in employment are considered to be working poor at the PPP$US3.10 a day benchmark. 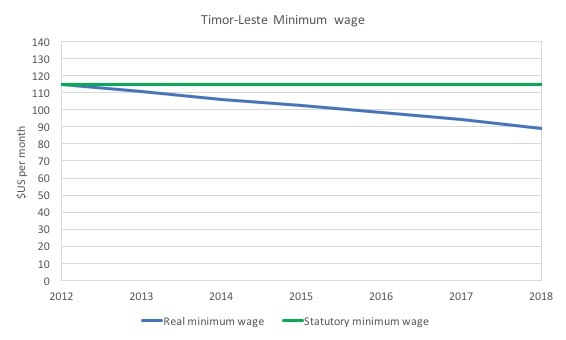 The introduction of a Job Guarantee – an unconditional job offer at a socially inclusive wage to anyone who desires paid work but cannot find it – would define the minimum wage for Timor-Leste. Careful consideration is required to determine its level. But it makes no sense to set the minimum wage at a level that maintains working poverty and creates incentives for low productivity, private sector development at the same low wages. It is clear that the statutory minimum wage in TL has to rise significantly if the nation is to achieve the development goals set out in its SDP. I will prepare more detailed estimates of the investments needed to create a functional and effective Job Guarantee program in Timor-Leste once I have access to better (more refined and granular) data. Further, I will prepare more detailed estimates of the likely fiscal parameters – Petroleum Fund depletion, growth in domestic revenue etc as better data emerges. It is difficult to be specific given the variations in the official data that is produced in various publications (Government fiscal statements, central bank statements, IMF, UNDP, World Bank, etc). There is considerable uncertainty about when the oil and gas reserves will be exhausted and the rates of return that can be generated on the existing (very large) $US16 odd billion Petroleum Fund. In the now defunct 126-page – State Budget 2017 Book 1 – there is a confusing array of estimates of the likely dynamics of the Petroleum Fund over the next 10 years. But while there is considerable uncertainty even within the Government’s own fiscal statements, it is clear that the ‘front-loading’ development policy that the Government has pursued in the context of declining oil revenues will see the Petroleum Fund depleted in the not too distant future. Some estimates place this date at 2032 while the La’o Hamutuk organisation “estimates that the Petroleum Fund could be empty by 2027” and that “Austerity starts in 2027” (Source). Whatever the reality of these competing estimates, the conclusion is that by failing to introduce its own currency the Government will deplete its Petroleum Fund sooner rather than later. The idea that the nation will switch at some point in the next 10-15 years to ‘austerity’ is highly problematic and is based on the assumption that it continues to use the US dollar. By introducing its own currency now, the Government can use the US dollar revenue it is still generating (and the stock in the Petroleum Fund) for imports and bring idle resources into productive use domestically using its own currency. That is a much more sustainable path to follow than trying to balance the extensive needs for human development against running out of US dollars in the Petroleum Fund. … a tax policy seeking to invest withn the country an amount exceeding the estimated sustainable revenue of the Petroleum Fund in order to set the conditions for diversifying the non-petroleum economy. Basically, it means the government has been spending more from the Petroleum Fund than the IMF considered would maintain its capital (the so-called estimated sustainable revenue (ESI) or the profits the nation receives from investing the Fund) and that means the Fund will deplete earlier than otherwise, leaving Timor-Leste with limited capacity to generate the currency it uses – the US dollar. I explained the setting up and operation of Timor-Leste’s Petroleum Fund including the concept of the ESI in this blog post – Timor-Leste – beyond the IMF/World Bank yoke (November 20, 2012). The ESI essentially is an assessment of the return on the Petroleum Fund investment and varies with oil price shifts and shifts in other financial asset prices. In Timor-Leste’s context, all the notions of fiscal space that the IMF and UNDP wheel out are moot. Constraining the notion of solvency to the balance in a foreign-currency denominated sovereign fund and claiming this limits what the government can do to bring idle resources into productive use is a typical neoliberal stunt. The case in general is explained in this series of blog posts – Fiscal sustainability 101 – Part 1 – Fiscal sustainability 101 – Part 2 – Fiscal sustainability 101 – Part 3. For Timor-Leste, the idea of fiscal sustainability tied to the Petroleum Fund in Timor-Leste becomes inapplicable if the government has its own currency. Clearly, if the government uses a foreign currency (in this case, the US dollar) and relies on exporting a commodity in US dollars for its tax base then it can run out of spending capacity should the exported resource deplete. But, fiscal sustainability with its own currency (which it can never run out of) becomes tied to what can be purchased with that currency that is available for sale. With the ridiculously high unemployment rate in Timor-Leste one would have to argue that these workers would not accept a new currency in return for work to maintain a position that the Timor-Leste government has limited capacity to spend its own currency. Clearly, once the government imposes all tax liabilities in the local currency then it would not take long for people to start demanding it. There are hundreds of developing countries that do have currency sovereignty which means they can enforce tax liabilities in the currency that the government issues. It doesn’t matter if other currencies are also in use in those countries, which is common. So the point is that as long as there are real resources available for use in a less developing country, the government can purchase them using its currency power and bring them back into productive use. The are hundreds of thousands of people in Timor-Leste who are unemployed or underemployed in the informal sector. They are real resources which have no ‘market demand’ for their services. The government of Timor-Leste could easily purchase these services with the local currency without placing pressure on labour costs in the country. 1. Introduce its own currency immediately. 2. Announce an unconditional, decentralised employment guarantee at a living minimum wage once they have put in place the administrative capacity to manage such a program. 3. Invest much more in education and health. 4. Divest investments in the oil and gas spaces. Tomorrow evening, I will be speaking at an event in Sydney about our recent book – Reclaiming the State: A Progressive Vision of Sovereignty for a Post-Neoliberal World (Pluto Books, 2017). The event starts at 18:00 and will run until 20:00. Admission $20 ($15 concession). I am receiving no speaking fee. The entry charge is going to the organisers to defray costs. [The adult literacy rate is around 58.4 per cent.] I wonder what is the definition of literacy. Can 58,4% of the persons older than 10 years answer correctly after reading a election program? [On the one hand, the current approach has been to invest in large-scale infrastructure projects – such as the South Coast highway project (Tasi Mane) and the Zonas Especiais de Economia Social de Mercadu de Timor-Leste (ZEESM) in the Oecussi region.] When I read that something BIG/LARGE is being built by private and/or public entities it comes to my mind the Great Peter Palchinsky who was killed by that human beast called Joseph Stalin. The Vivid Sydney festival starts tonight (Friday) so getting to the venue (and getting out) may be an issue. As a reward people can have a nice walk afterwards. I have very much enjoyed reading this series and learning about applying the MMT lens to a developing economy. Like the surrounding islands of eastern Indonesia, tourism will not become significant until malaria and dengue are eradicated. Expensive promotions won’t change this. The $US confers an advantage in relation to Indonesia, with which most trade is conducted. The Rp remains a second currency in border districts where villages rely on trade conducted in $US and Rp to survive. I should also add that the black market economy is greater than the official import stats. The Tasi Mane fantasy is just a renamed iteration of the old Indonesian BENAVIK south coast development plan. The immediate priority should be to invest in universal education, to equip as many kids as possible with the skills to obtain employment abroad and a chance to emigrate permanently. When proceeds from Sunrise are gone, and the majority of youth remain uneducated, an historical opportunity will have been squandered. At village level parents remain unwilling to sell a buffalo to pay for a child’s further education. This requires a shift in cultural values and a leadership willing to explain why it has to happen, and the consequences if it doesn’t. Politicians everywhere are unwilling to admit failure, all the more so in ET where those politicians are vulnerable to charges they lied to voters in 1999.